A Cutaway View of Celebrity Silhouette. 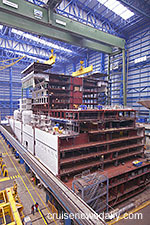 Construction is in the early phases of Celebrity's fourth Solstice-class ship, Celebrity Silhouette. CND gave their readers the ultimate "cutaway" view in this photo taken at Meyer Werft.